Remedies Considered Prior to Window Film: The windows are already constructed with low-E glass. Window film was the only option considered for further protection.Remedies Considered Prior to Window Film: The windows are already constructed with low-E glass. 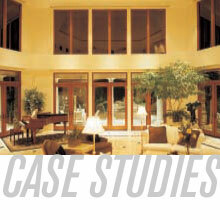 Window film was the only option considered for further protection. Applying window film up the home’s elevator shaft presented a challenge because of the tight quarters and the awkward positions required to reach windows. In addition, since the home was still being constructed during much of the installation, special care had to be taken to eliminate dust particles from “floating” under the film as it was being applied. When the owner of a 14,000-square-foot dream home in Sedona, Arizona, designed his residence, he included numerous towering windows that invited splendid red rock mountain views on every side of his property. But along with those views, he knew he would have to contend with one problem – the sun. While he wanted to control the sun’s negative effects, such as damaging UV rays, glare, and heat, he didn’t want to compromise the views with heavy draperies or blinds. The Sedona homeowner had encountered a similar issue at his manufacturing plant a year earlier. Working with local 3M Scotchtint™ window film dealer Ross Kehl, owner of Synchronicity, Inc., he had 3M window film applied to the building’s windows. According to Kehl, Night Vision window film made sense for several reasons. Based on the location of the windows, Kehl used three out of the four shades in the Night Vision line. Windows facing north were covered with Night Vision 35, the film with the lightest tint. For windows facing east, west, and south, he applied 3M Night Vision 25. Finally, the windows on the home’s elevator shaft were covered with Night Vision 15, for maximum privacy. Preliminary results indicate that Night Vision window film will save the homeowners 10 to 15 percent in energy costs per year. Even so, the homeowner is more pleased with the film’s other benefits.